the reduction of the residual, or remanent, magnetization of a ferromagnetic body, such as a specimen of some material or a component of a device, after the external magnetizing field is removed. Magnetized components made of ferromagnetic materials are usually demagnetized for various reasons prior to the assembly of instruments and devices. It may be desired, for example, to eliminate the effect of residual magnetic fields on measuring devices or the sticking of ferromagnetic particles to components. Specimens used to determine the magnetic properties of materials are also demagnetized, since these properties are dependent on the previous magnetic history of the specimens—a phenomenon called hysteresis. 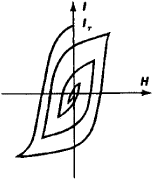 Components or specimens are considered to be demagnetized if the directions of magnetization of the domains, or regions of spontaneous magnetization, are arrayed randomly and if the average magnetization (magnetic induction) in any cross section is equal to zero or is less than a value determined by specifications or established standards. Demagnetization may be carried out in several ways. Heating the specimen or component above the Curie point causes the substance to lose completely its ferromagnetic properties. Such heating followed by cooling in the absence of any external field results in the most complete demagnetization. In most cases, however, this method of demagnetization cannot be used, since the heating may alter mechanical and other properties of the material. Another widely used technique for demagnetization, called AC demagnetization, consists in the alternating magnetization of the component or specimen by an alternating magnetic field whose amplitude decreases smoothly to zero (Figure 1). Here, the maximum value of the amplitude of the alternating demagnetizing field must generally be no less than that of the magnetizing field. The effectiveness of the demagnetization depends on the frequency of the demagnetizing field, the rate of decrease of the field, the thickness of the component, and the depth of penetration of the field. The thicker the specimen, the lower the frequency of the demagnetizing field. The higher the permeability of the material, the lower the rate of demagnetization—that is, the greater the number of demagnetization cycles. Standard specifications require that a specimen consisting of plates of electrical sheet steel 0.35-0.5 mm thick be demagnetized for 1 min by smoothly decreasing a 50-hertz magnetic field from maximum field strength of 2,000-2,500 amperes/m to zero. From 30 to 60 alternating magnetization cycles are generally sufficient for demagnetization. Kifer, I. I. lspytaniia ferromagnitnykh materialov, 3rd ed. Moscow, 1969. The process of reducing or removing the magnetism of a ferromagnetic material. The reduction of magnetic induction by the internal field of a magnet. Deflocculation in dense-media process using ferrosilicon by passing the fluid through an alternating-current field. In this study, the authors researched how to improve the demagnetization temperature by first determining trends in heavy rare-earth-free magnets. Jahns, "Investigation of the rotor demagnetization characteristics of interior PM synchronous machines during fault condition", Energy Conversion Congress and Exposition (ECCE), 2012, pp. 2) Heat transfer: The right side thermal switch turns ON, and the heat generated by magnetization is transferred to the right side magnetocaloric slabs that experienced a temperature decrease owing to the demagnetization. The demagnetization risk of ferrite magnets has been analyzed with the proposed models. However, the temperature span generated by a cycle of magnetization demagnetization is limited to a couple of degrees, for instance near 2K/T for gadolinium. The specimen remnant vectors obtained after laboratory AF demagnetization have been averaged to obtain the sample mean ChRM vectors using Fisher's (1953) method. 5T machine is not available, and if the benefits of the scan far outweigh the rick of cochlear implant demagnetization. In this case, adiabatic magnetization and demagnetization are isentropic processes; therefore, when the material is subsequently demagnetized, its temperature will return to its original, zero-field value. Today's MRIs typically require steel shielding to contain their strong magnetic field to prevent demagnetization of pacemakers, credit cards, etc. These parts are especially suitable for free-wheeling, clamping, snubbing and demagnetization functions in power supplies and other power-switching applications. Features include over-temperature and over-voltage protection for safety, demagnetization detection, reduced power frequency during standby (less than 3W), universal mains supply operation (from 70V to 276V AC) and the ability to be used for power ranges up to 250W. We analyzed the directions of magnetization of 60 rock samples taken from borehole cores drilled within and in the vicinity of the structure using thermal and alternating field demagnetization.